While I hate to encourage people to remove GMass from their Gmail accounts, there are several legitimate reasons you may want to. Over the last week, several Gmail users have been victims of a sophisticated phishing attack where the scammer obtains the username and password for a Gmail account, logs in, installs GMass, then sends a mass email containing a form that looks like a Dropbox form to all the user’s contacts, and encourages the victim to log into Dropbox with his/her Gmail account credentials. 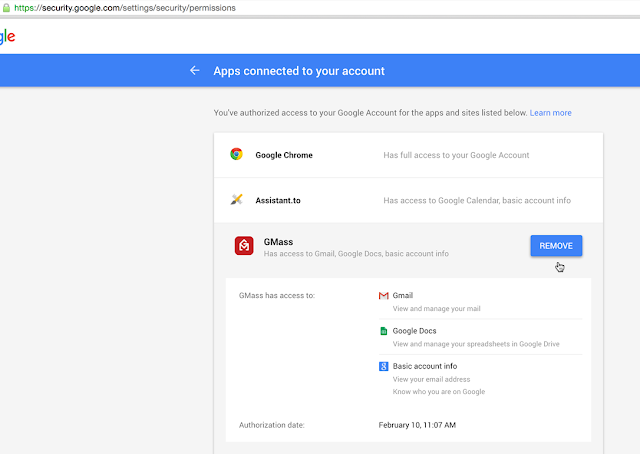 Then, after obtaining more Gmail account credentials, the scammer logs into those accounts, installs GMass, and repeats the cycle. 1. Change your username and password immediately. If GMass is listed here, and you are not a GMass user needing to send email campaigns, you can easily remove GMass. Need to cancel a scheduled email marketing campaign? If you are a legitimate GMass user and only wish to cancel a scheduled email marketing campaign but intend to use GMass later, then you do not need to remove GMass from your account to prevent the email from sending. Follow these instructions instead to cancel a scheduled emailing. I want to delete / remove and deactivate the GMass. I am not into the business where such applications are needed. Please help me to do it as the procedure described above did not work and I still see GMass icons (two at the top next to search icon & one next to send button). If you would like to uninstall GMass, simply go to chrome://extensions to remove GMass from Chrome. If you have any issues, see: http://blog.gmass.co/2016/11/how-to-get-best-support-from-gmass-team.html to get the best support from our team. Even after disconnecting GMass from Google and Chrome, the buttons are still showing up in Gmail, and I’m getting pop-ups requesting that I connect GMass. I’ve restarted Chrome as well as my computer too. How do I completely remove GMass from my account? Nevermind, I’ve got it now. Thank you! Hi Jonathan! How did you remove the buttons of GMass on your Gmail? Thanks! I’ve disconnected GMass from Chrome extensions but the buttons still appear in Gmail, I’ve restarted Chrome and my my computer with no effect.. How do I completely remove GMass from my account? I have the same issue. Did you get a result from anywhere? This is so annoying and I wouldn’t recommend Gmass to anyone if you can’t remove this THING when you want to. Remove it from Connected Apps. Remove it from Extension. Then go to and change your google password. This will surely help. Hi guys. I had the same issues. I had to go into the “Label” settings in my gmail account and delete the Gmass label. This worked for me. Cheers.